Thanks to the Three Tenors, the Irish Tenors, and even Three Mo’ Tenors, you probably have a good idea of what the tenor voice type sounds like. 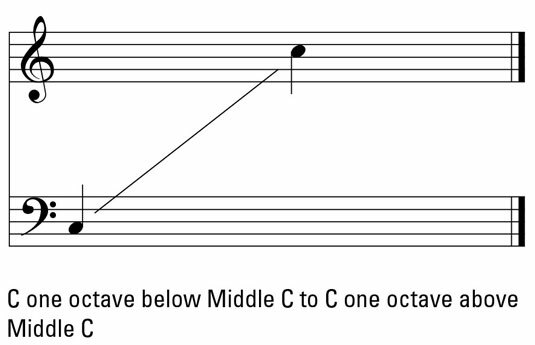 Range: The tenor range, shown in the illustration below, is about two octaves, with many singing a little lower than C (second space in bass clef) and a little higher than the male High C (third space treble clef). Register: The tenor voice doesn’t make a huge transition from his lower voice to his middle voice. His transition into his middle voice occurs around D just above Middle C or the E-flat just above Middle C and then a transition into head voice around G or A-flat above Middle C.
Strength: The tenor’s strength is his head voice. Voice tone: The tenor voice is usually bright and ringing. Weakness: His weakness is often his chest voice. Subdivisions: In musical theater, a subdivision of the tenor, called the baritenor, reigns. This voice type is someone with the power to project in the middle voice and the higher, ringing money notes of the tenor. The other voice type that you frequently hear in the opera world is the countertenor — a male singer who sounds like a female. This voice type sings in the same range as the mezzo (sometimes soprano) and sounds similar. When you’ve heard the countertenor singing enough, you can distinguish him from a mezzo. Until then, just enjoy the unique quality that these gentlemen bring to the singing world. Tenor subdivisions in the classical world include light lyric, full lyric, dramatic, and heroic. The heroic tenor is also called a dramatic tenor — the guy who has a large voice with great stamina. Don’t challenge him to a singing contest at the local pub. Common performance roles: The tenor is almost always the lead who wins the girl at the end of the show. Examples include Rodolfo in La Bohème, Don José in Carmen, Tony in West Side Story, Billy in 42nd Street, and Rolf in The Sound of Music. Naming names: Famous tenors you may know include Placido Domingo, José Carreras, and Luciano Pavarotti, whom you may recognize as the Three Tenors. You also may know Enrico Caruso, John Denver, Elton John, Gary LeVox (lead singer of Rascal Flatts), Maxwell, Justin Timberlake, and Stevie Wonder.